One of the many things I love about London is that there are still customs being performed, away from the crowded “tourist” areas of the city which have been on-going for many years. 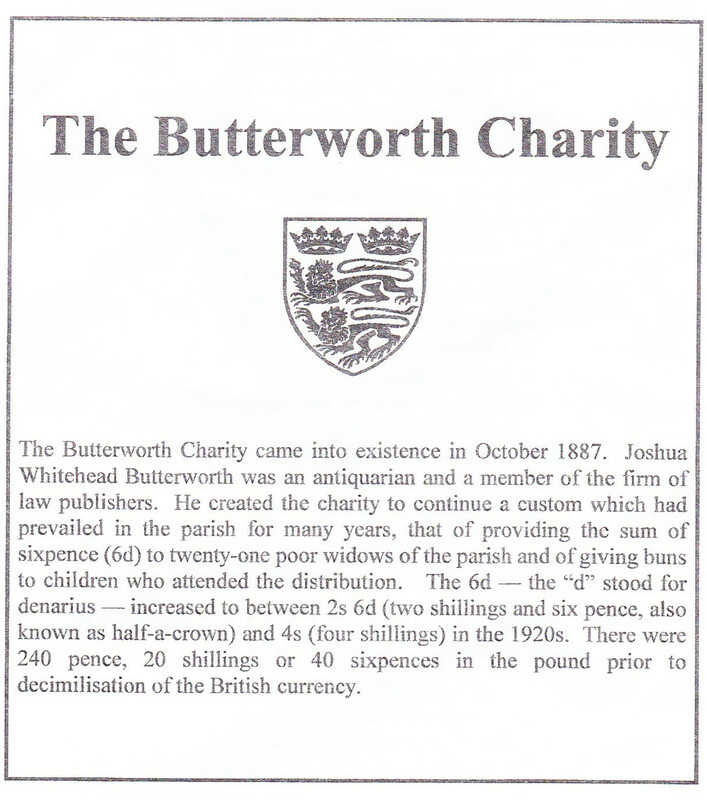 One of these is the Distribution of the Butterworth Charity which takes place every Good Friday in the churchyard of the Priory Church of St. Bartholomew the Great in West Smithfield. 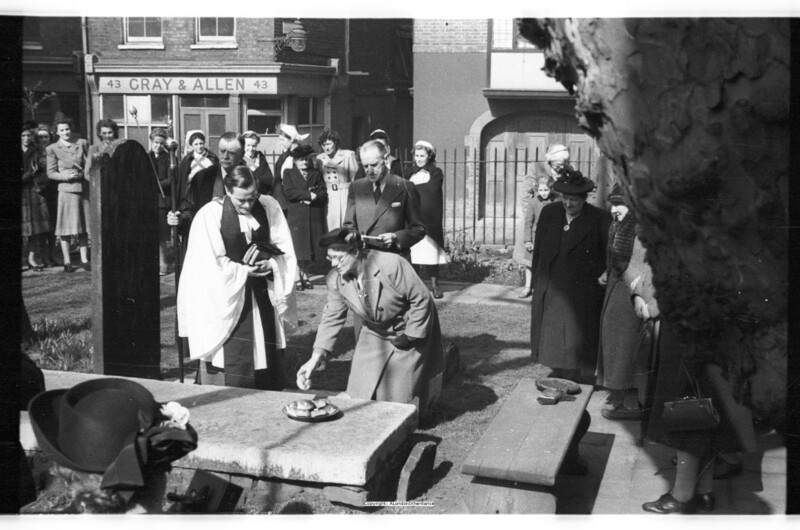 Within my father’s photo collection there are photos he took of this about 65 years ago, so to experience the same event, I took the short walk from St. Paul’s underground station to St. Bartholomew’s ready for the 11:30 start, where I joined a crowd of about 80 people arranged around the edge of the churchyard, on a mild, sunny April morning. 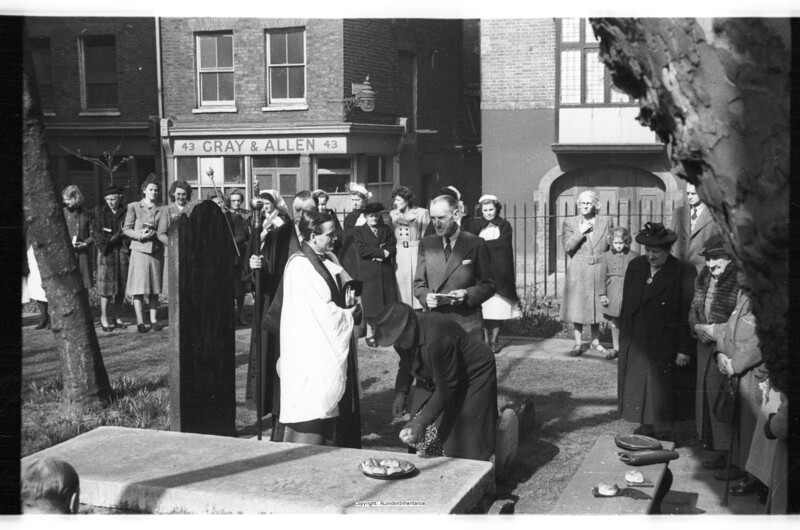 The ceremony takes the form of a church service in the graveyard with the distribution of the charity part way through. 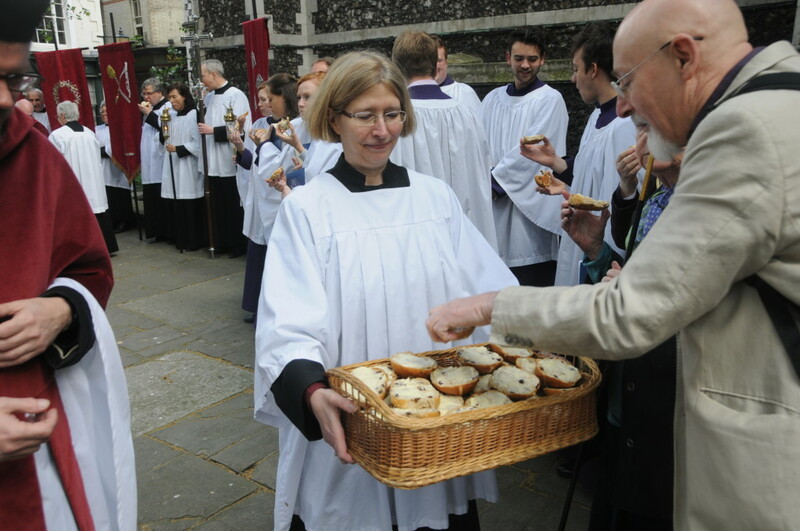 The form now is a token distribution of money to a poor widow of the parish (there was only one “volunteer” for this) followed by distribution of buns to all who attended. 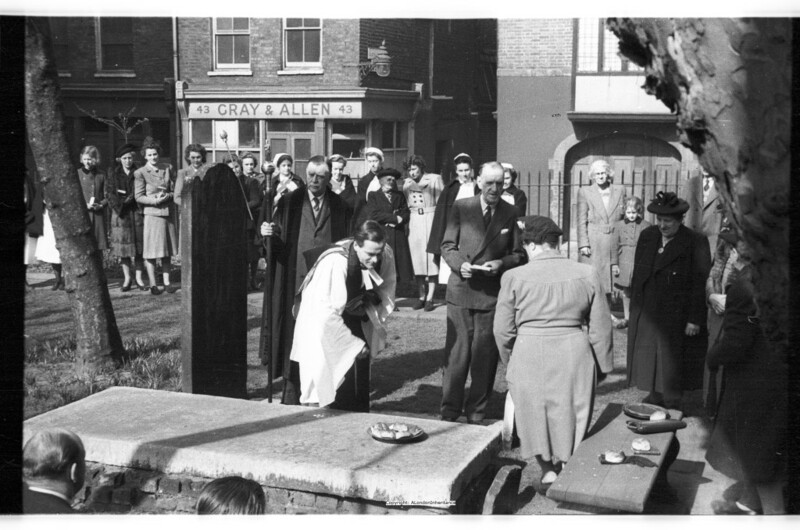 The ceremony is held on the same flat gravestone every year. What I also find interesting in these photos are the people in the background. Note in the above the nurses in uniform, who had probably come from the adjacent St. Bartholomew’s Hospital. 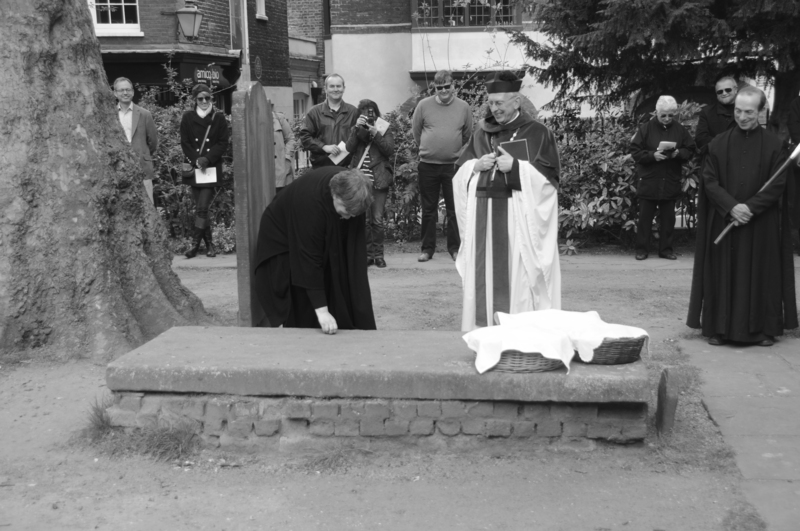 The widows of the parish are waiting to the right of the photo. The following is my photo from the 2014 distribution. I have converted this to black & white to give an up to date photo which compares more easily with my father’s original. 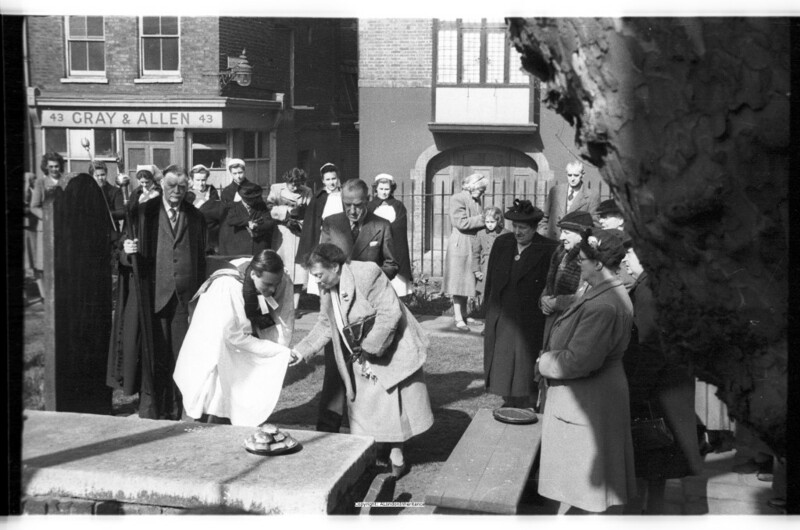 Often I find that comparing a colour photo with black & white can over emphasise the differences. 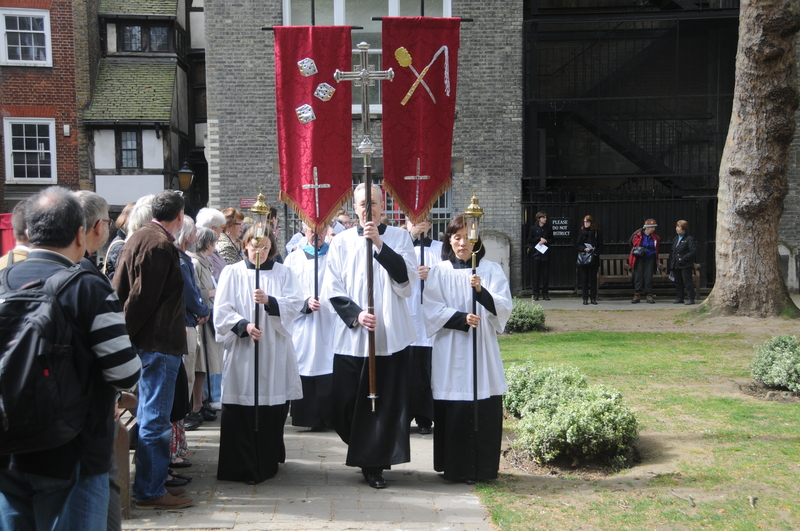 The buildings along Cloth Fair at the back of the churchyard are the same. 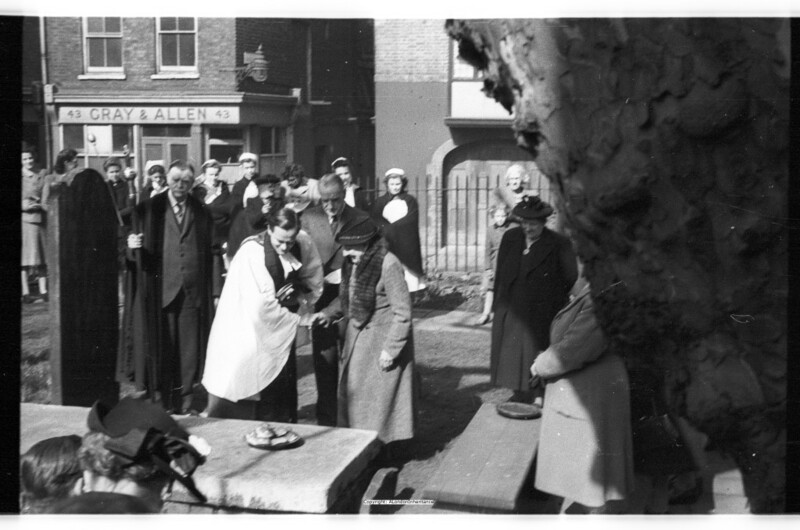 The tree to the left has grown considerably, fashion has changed and these days there are not so many “poor widows” in the parish to collect the distribution of the charity, however the scene has not changed that much in 65 years, and I suspect is much the same going back to the start of the Butterworth Charity over 100 years ago. It was a perfect start to an Easter weekend. This entry was posted in Events and Ceremonies, London Churches on April 20, 2014 by admin. A very good contrast to @thegentleauthor post on same topic. Pedantic as I am, have the ordained become a touch “higher”, compared with sixty-five years before, I base this on the rich burgundy worn? I suspect you are right and they have become a bit “higher” over the past sixty-five years, despite comparing in black and white. 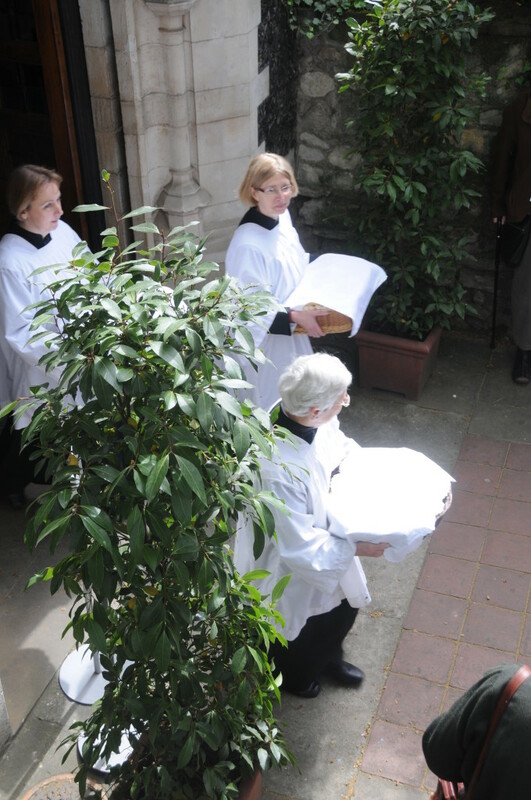 Lovely, David – I really like all the ceremonies that go on in London that are so little known. It was a nice touch to post your comparison photo in black and white – I agree with you that colour often highlights differences rather than emphasizing the similarities. Thanks for the feedback Vivienne. 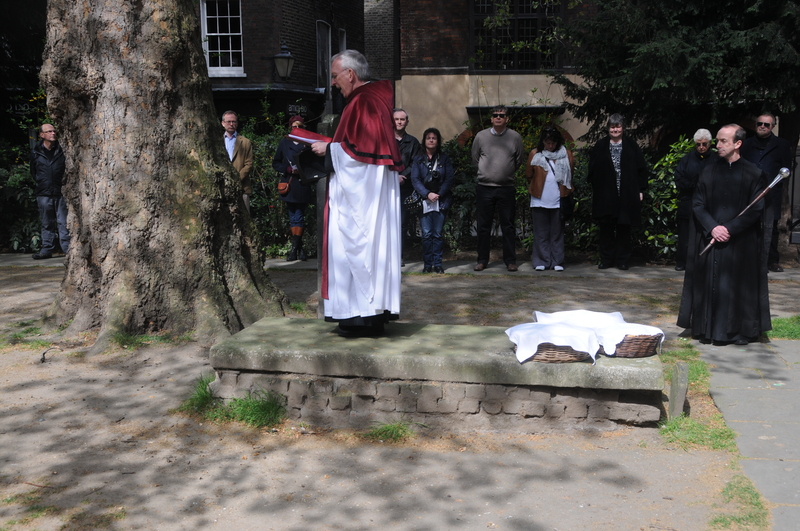 Going back to one of your earlier posts, I am sure the tree in the churchyard is a Plane tree. It was interesting to see the growth in 65 years. Working backwards I guess the tree must be some 90 years old.